We are supporting PRIVATE INSOMNIA on their CD presentation show at the B72. It will be on Monday, September 26 starting at 8 pm. 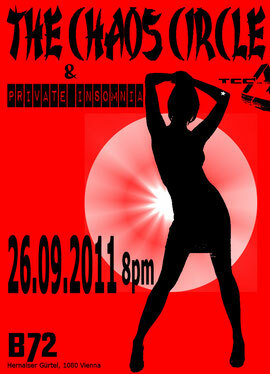 And on October 20 we're doing a show at the Poco Loco in Graz. ... all for joining our acoustic show last Friday at The Local Bar. First videos from this concert are already online. Take a look in our VIDEOS section. 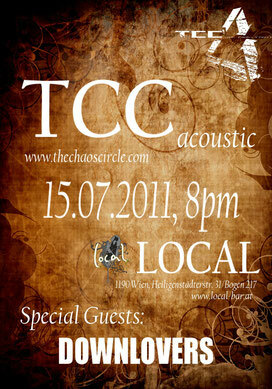 LOCAL Vienna on July 15. Our support will be the DOWNLOVERS from Graz. Tickets for 5 euros will be available soon. We moved to our new "homebase" on Burggasse and will start recording our latest material soon in the newly founded FARADISE STUDIOS. Chaosresearch is dealing with non-linar systems, whose behaviours are not predictable, like the rhythm of the heart or traffic jams. And this is what TCC is trying to cause with loud feedbacks and turbulences. The roots of this vienna-based circle are anchored in indifference, which is drawn through their current album SO WHAT?